Splunk big data tool works with both structured and unstructured data. Splunk covers a range of pre-configured rapid deployment packages for ease of big data content analysis and readily pluggable for corporations to slice and dice their visualization and turn the data into valuable decision-making actionable insights for achieving operational excellence in business intelligence competency centers. Similar to Tableau and QlicView, Splunk has powerful search algorithms to search for the content and start analyzing the raw information to sophisticated outputs in the form of dashboards and report analytics (Splunk, 2015). However, Splunk takes a completely new approach for connecting to the data sources when compared to Tableau and QlikView. Splunk builds dynamic enterprise knowledge to connect from text files all the way to most complex and sophisticated data sources. Splunk schemaless or dynamic schema works perfectly for unstructured data, as it can adapt from target data schema. In essence, there is no limitation for Splunk to connect to any data source in the world of databases. Splunk delivers around more than 500 database connection applications to a bevy of databases. Leveraging open database connectivity, Java database connectivity, and several other connectivity applications, Splunk can connect to any database source without limitations. 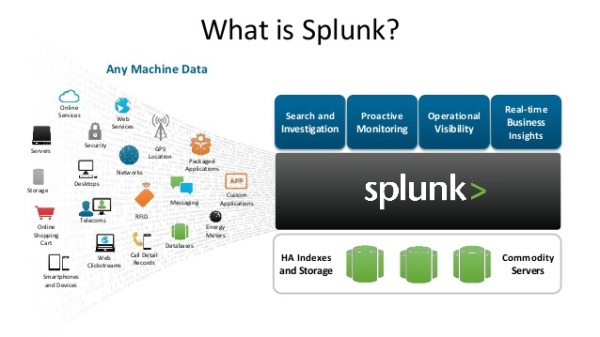 The capabilities to connect to any data sources provide the agility for Splunk to aggregate and analyze machine-generated data from various corporate data logs and index the data (Splunk, 2015). Most of the big data tools require storing the databases in several locations and blend the database into the big data. Splunk does not require a proprietary database. Data can be stored on Splunk seamlessly. Dynamic schema or schemaless approach from Splunk allows connecting to any database source without requiring supporting structure and formatting types. Splunk fundamentally builds the data indexing on a slew of logs generated by machines, sensors, world wide web. Splunk is not built keeping in view Business Intelligence objectives. Due to lack of powerful visualization capabilities, many organizations connect from Tableau to open database connectivity to Splunk to pull the data and build the dashboards on Tableau. Some organizations use Splunk as real-time indexing of the data and less for visualization of dashboards, though Splunk has some nice dashboards capabilities. Splunk is heavily leveraged for data indexing in real-time for gleaning the data out of the sensors, logs, and several other unstructured machine-generated data sources (Splunk, n.d.). Splunk has a new concept, where the licensing cost and data consumption are inversely proportional. The cost proportionally reduces as the consumption of the data goes higher (Splunk, 2015).